The Department of Research Programming has been studying modern genre paintings since 2009 through a joint research project with the Tokugawa Art Museum. 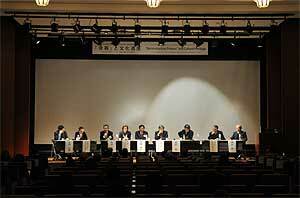 On January 29, 2011, we held a seminar at the National Research Institute for Cultural Properties, Tokyo to report on this research. At the seminar’s start, Mr. Tokugawa Yoshitaka, the president of Tokugawa Reimeikai Foundation and the director of the Tokugawa Art Museum, gave a talk on IT technology in recent years. Ms. Emura Tomoko then gave a presentation entitled “Depictions in Kabuki Performance and Audience” that focused on details in the scrolls (important cultural properties in the collection of the Tokugawa Art Museum) and characteristic expressions of figures that have been overlooked by past studies of art history. Then, Ms. Yoshikawa Miho, a curator of the Tokugawa Art Museum, gave a presentation entitled “Expression in Genre Figures, said to be based on the romance of Honda Heihachiro and Lady Senhime.” She talked about the depiction of figures in the screen” (an important cultural property in the same museum’s collection) and showed slides of high-resolution images. She reported on the depictions, saying that the woman wearing a kosode with crests of hollyhock appeared to have drawn-in eyebrows, which was a custom and cosmetic practice of noble women at the time. 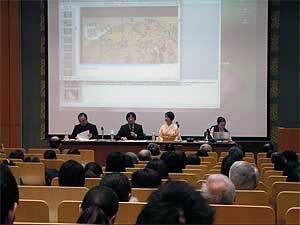 Then, there were discussions chaired by Mr. Yotsutsuji Hideki, the deputy director of the Tokugawa Art Museum. Also participating in discussions concerning image data was Mr. Nakamura Yoshifumi of the National Institute of Informatics. Over 110 participants in fields related to art history, music history, the history of the performing arts, the history of fashion, and the restoration of cultural properties participated in the seminar. Following lively discussions, the seminar concluded. Full-scale images of the two scrolls that make up Kabuki Performance and Audience, which spans 15 meters, were displayed in the lobby in front of the seminar hall for participants to see. 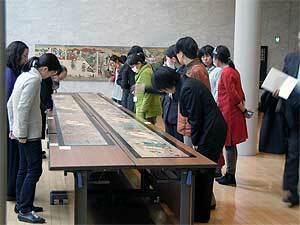 We will continue to study such art and publicize our findings in the future. We held the 34th international symposium on the conservation and restoration of cultural properties “‘Rehabilitation’ and Cultural Heritage” at the Heiseikan of Tokyo National Museum for three days from January 19 to 21. Concerning the relationship between societies, which are often in the process of recovering from a natural disaster or conflict or in the midst of changes, and cultural heritage, we provided three sessions that correspond to these circumstances. 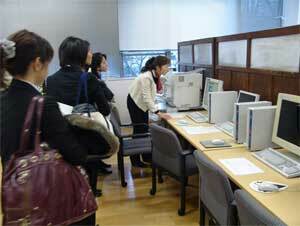 There were ten lectures presented by persons from overseas countries and four lectures given by Japanese. Then there was a lively discussion among the chairman and lecturers, covering a range of issues such as which cultural heritages should be restored for people while the meaning and assessment of cultural heritage is changing depending on the social circumstances. A report on the details of this symposium will be issued next year.